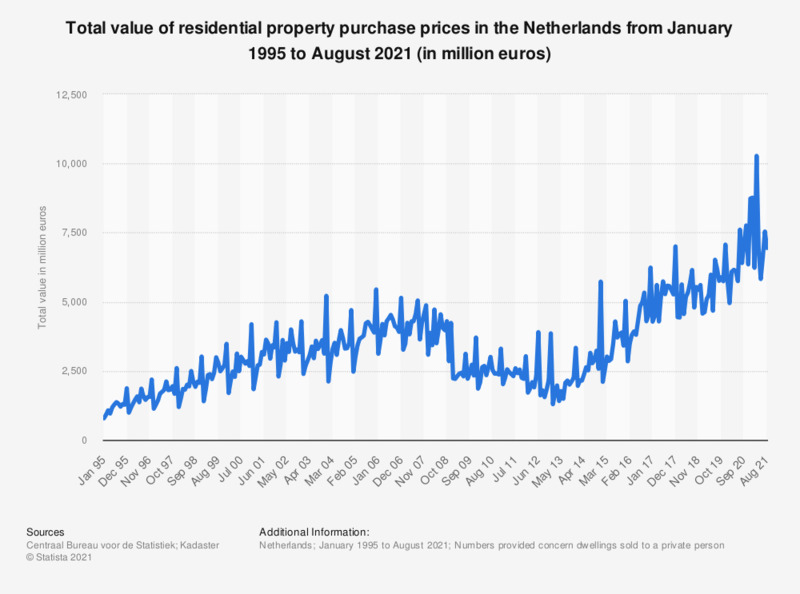 This statistic shows the total value of dwelling purchase prices in the Netherlands from September 2016 to September 2018 (in million euros). In September 2018, approximately 4.8 billion euros worth of dwellings were sold to private persons in the Netherlands. In recent years, the housing market has continued to rise in the Netherlands due to low mortgage rates, a recovering economy and a high level of consumer confidence. For example, the number of registered transactions reached a value of approximately 215,000 in 2016 and the average selling price of houses was higher than in 2013, when prices reached a low point. In 2018, real estate prices are expected to increase with five percent as a high number of sales, combined with an increasingly scarce supply, are expected to push the housing price up. The numbers provided concern dwellings sold to a private person. Everything On "Residential real estate in the Netherlands" in One Document: Edited and Divided into Handy Chapters. Including Detailed References. How would you set the selling price of your home if you were to sell it? What place does the Internet occupy in the context of a search for information on real estate?